Cappadiocia's spectacular lunar like landscape has always appealed to travellers seeking something new. Above the ground the Volcanic anthills and chimneys are totally unique. Below ground the famous warrens of cave villages hewn into the basalt are equally unlike anything you'll find elsewhere. If you want to experience this special landscape in style then Ürgüp is for you. Many of the best places to stay in Urgup can be found in the town's best traditional caves and beautiful honey coloured stone buildings, many of which have been converted into upmarket hotels or restaurants offering fine dining. The fertile soil is excellent for producing grapes and visiting a winery to taste some of the sweet local Ottoman-Greek specialities is one of the things you should definitely try. Along with a visit to the local museum, a trip up Temenni Wishing Hill - for the views of Ürgüp, or perhaps a balloon ride. It's also possible to explore the landscape on horseback. Cappadocia's moonscape was created around 70 million years ago by a massive volcanic eruption but it was the threat of a different kind of violence which lead people to move underground. The volcanic soil makes the area rich and fertile, so this strange countryside was fought over again and again. People burrowed underground, cutting into the rock and hollowing out around thirty underground cities. There are around a thousand churches. Do as the locals and get scrubbed down in a local hammam. Take a balloon ride over the moon-like landscape. Visit the local wineries and sample the produce. Get out of the city and horse ride or hike across the epic terrain. Our guide to the best places to stay in Ürgüp has something for all tastes and budgets whether you're looking for a cheap and cheerful B&B or a little luxury. 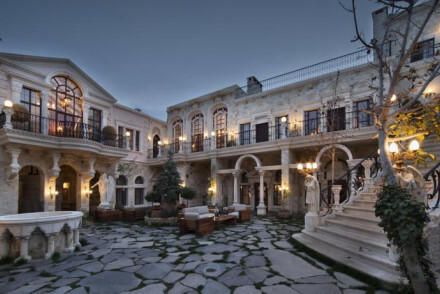 The Hezen Cave Hotel is a particularly fine example and one of the best places to stay in Ürgüp if you like your accommodation rustic but chic and with plenty of exposed stone. But most importantly, above ground! Sacred House Hotel is a renovated grand townhouse packed with character. Individually styled rooms feature arches, exposed stonework, domed ceilings and particularly impressive bathrooms. One of the largest towns in Cappadocia, Ürgüp also makes an excellent base for exploring the whole region. And you're right near Ortahisar where there's a castle, a monastery and a folk museum. Serinn House is a wonderfully chic designer hotel in a beautiful rustic setting. The minimalist decor makes the most of this almost fort-like building against a picturesque backdrop. Argos in Cappadocia is a spectacular place to stay! Once a monastery, this collection of ancient stone houses and tunnels is right in amongst the smooth lunar cliffs. It has one of the most magical views in the region. Closer to Uchisar than Ürgüp, Argos is a great place to stay if you want to explore the whole region. If you don't like the idea of sleeping below ground but you still want a cave hotel experience, the Sultan Cave Suites are an excellent compromise. This regal house is cut into the side of a cliff so while some of the 30 rooms are cut into the rock they're not below the earth - the impressive views of Göreme are a bonus as well. The city looks as if it was dug into a basin from here. Kayakapi Premium Caves is a stunning and unique hotel comprising of restored historical caves carved into the soft stone cliffs of Kayakapi neighborhood in Göreme National Park. 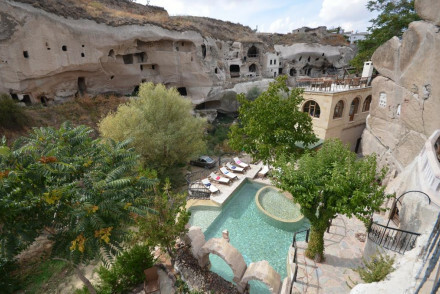 Stay in the charming Gamirasu Cave set within a system of caves in the rural Turkish village of Ayvali. The elegant rooms are full of character with antique furnishings and exposed vaulted ceilings. Fly to either Kayseri Erkilet Airport (ASR) or Nev?ehir Kapadokya Airport (NAV) which are both well connected to Istanbul. From either airport the journey to Urgup is less than an hours drive. Kayseri is also on a busy railway route and there are good links from all across Turkey. Best time to visit - Cappadocia is a year-round destination and in winter there’s the added bonus of skiing in Erciyes (see “The Best Hotels” below). April, May and June are excellent in terms of temperature as are September and October. July and August tend to be very hot. Browse through our list of all the best places to stay in Ürgüp. Alternatively check out our full listing for Cappadocia. A renovated grand townhouse packed with character. Individually styled rooms feature arches, exposed stonework, domed ceilings and particularly impressive bathrooms. An extensive spa, complete with authentic hammam, is the perfect spot to unwind after a day of culture. A gem of a property. Local exploring - The hotel is situated in a historically fascinating area. Sights nearby - Visit the Devrent Valley, full of interesting rock formations and just 2km from the Urgup. Restrictions on children - Over 15's are welcomed.